For more than thirty-five years, Attorney Mike Rudolph has devoted himself to defending people charged with Felony and Misdemeanor criminal or drunken driving charges. Regarded by many as the Fox River Valley's best criminal defense lawyer, Attorney Mike Rudolph has tried more than one hundred jury trials in more than twenty-five Courts across Wisconsin, negotiating many dismissals and winning many outright acquittals. Wisconsin laws are tough. They include fines, jail time, loss of driving privileges and, sometimes, devices put on vehicles interfering with and embarrassing a person. Accidents can increase the punishments, and deaths caused by accidents when a person is drunk have very severe sentences. If you have been arrested for a OWI/DUI you can dramatically improve your chances of having a much better outcome by taking the proper immediate action to defend yourself against the OWI/DUI charge. Attorney Mike Rudolph represents people accused of committing criminal offenses. You can count on Mike to properly guide and inform you throughout the entire legal process. If you are facing criminal charges, call Attorney Rudolph (at 920-730-8533) to discuss your case. You'll also learn why you aren't going to jail today. 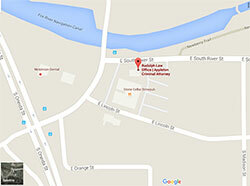 Rudolph Law Office is located in Appleton, Wisconsin, 'between the locks' at 111 East South River Street. For directions, please click map or here. While you are welcome to stop by, it is best to call and talk with Attorney Rudolph about your case, and set an appointment if you need to meet with him to ensure he's in the office. Attorney Mike Rudolph most frequently represents people whose cases are heard in the Courts located in Outagamie County, Waupaca County, Winnebago County, Calumet County and Brown County.The majority of Attorney Rudolph's cases arise out of incidents occurring in Appleton, Allouez, Ashwaubenon, Bellevue, Black Creek, Brillion, Clintonville, Combined Locks, De Pere, Denmark, Grand Chute, Green Bay, Hobart, Hortonville, Howard, Kaukauna, Kiel, Village of Kimberly, Lawrence, Menasha, New London, Ledgeview, Little Chute, Menasha, Neenah, New Holstein, New London, Omro, Oshkosh, Pulaski, Seymour, Shiocton, Suamico, Waupaca, Winnebago, Winneconne, and Wrightstown, Wisconsin. Please feel free to call (920-730-8533) Attorney Rudolph directly to discuss your criminal or drunk driving case.